Well actually I lost my lens cap....could be worse. I know that it will surface one day, after all - A. who would steal a lens cap. B. as caps go, it is really rather minor. C. make a list of everything you know that involves "caps" and you will know how insignificant this really is!!!!! So why would I pay $300.00 for a lens cap - well there was a small camera attached to the cap. Not the camera I actually came into buy the cap for - well that would be ridiculous - that would only have cost $7.00 and I would have been in and out in 10 mins. No the other camera that was attched to the lens cap...or wait, maybe this new camera really didn't need a cap, because it had a retractable lens and, oh yes, did I mention that it could take video - you know the Youtube type video - just a minute or two - actually 15min and then you edit - of course, if you can understand the crytic software intructions for editing video and life....alas poor Yorick....right time of year - wrong software. Anyway, I ramble. I bought a small Canon camera to take stills & video. It is minute, my intention. If all else fails I could support the secret service...again, you know....little old lady...arrested as international spy, who would have thought.... I intend to go onto the Canon site and tell them that my next camera will be a Nikon because of the inferior movie editing software that they have provided with the particular Canon camera I bought. Hope yours was better than mine. 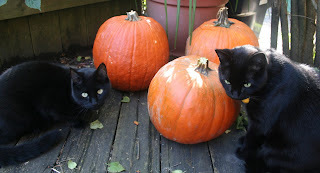 Here's a pre-hallowe'en picture. Looking forward to tomorrow...I love Hallowe'en!!! !